Though this is SOOOO bad for you, it's SOOOO good. 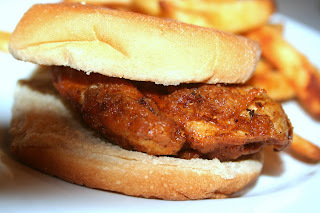 My husband and I love Wendy's Spicy Chicken but we don't have Wendy's in our city anymore so I searched for a recipe online and found it on many websites. - Preheat 6 to 8 cups of oil in a deep fryer to 350 degrees. - Combine the pepper sauce and water in a small bowl. - Combine the flour, salt, cayenne pepper, black pepper, onion powder, paprika and garlic powder in another shallow bowl. - Pound each of the chicken pieces with a mallet until about 3/8-inch thick. Trim each breast fillet if necessary to help it fit on the bun. - Working with one fillet at a time, coat each piece with the flour, then dredge it in the diluted pepper sauce. Coat the chicken once again in the flour mixture and set it aside until the rest of the chicken is coated. - Fry the chicken fillets for 8 to 12 minutes or until they are light brown and crispy. Remove the chicken to a rack or to paper towels to drain. - As chicken is frying, prepare each sandwich by grilling the face of the hamburger buns on a hot skillet over medium heat. Spread about 2 teaspoons of mayonnaise on the face of each of the inverted top buns. - Place a tomato slice onto the mayonnaise, then stack a leaf of lettuce on top of the tomato. - On each of the bottom buns, stack one piece of chicken. Flip the top half of each sandwich onto the bottom half and serve hot.